A water-tight solution made from EPDM rubber, designed to withstand heavy rolling load traffic. Built from high-strength aluminium. Designed to prevent damage & deterioration while avoiding annoying clanking noises. CS Gasketed EJCs for car parks are designed for regular, high rolling loads. These highly durable joint covers are suitable for both internal and external areas while offering superior multi-directional movement capabilities. Delivering reliable, long-term solutions, these EPDM covers are designed to eliminate many of the common problems associated with expansion joints in parking structures. Unique to CS, the Zip Block (ZB) Series eliminates the problems of noisy, leaking metal cover plates. Formed as a one-piece extruded EPDM elastomeric seal, the system requires no mechanical fixings, which reduces installation time by at least 30%. The ZB series is watertight and can be installed over green concrete, and significantly reduces the chance of substrate breakaway or cracking. It offers a problem free, extremely durable long-term solution that is much stronger than traditional elastomeric concrete systems. 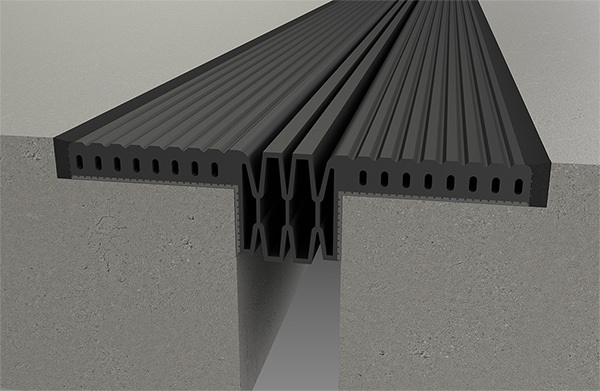 The expansion joint system contains an integral nosing, which is bonded to the substrate with high strength epoxy adhesive, and is suitable for both internal and external applications. Being recess mounted, the system does not present a raised obstacle in the path of shopping trolleys or wheelchairs. Superior multi-directional movement capabilities allow 50% in horizontal movement along with vertical and lateral movement. This represents a clear advantage over many metal joint systems that cannot withstand vertical and lateral movement without significant damage to the joint, leaving fixings exposed to trip hazards and vehicle damage. Eliminates problems of noisy, leaking metal cover plates. Recess mounted – meaning shopping trolleys and wheelchairs do not need to negotiate raised obstacles. Hairline cracks in the concrete are caused by vehicles constantly hitting the nosing of the joints between the concrete and expansion joints. As time progresses, the cracking becomes more severe and this leads to failure. 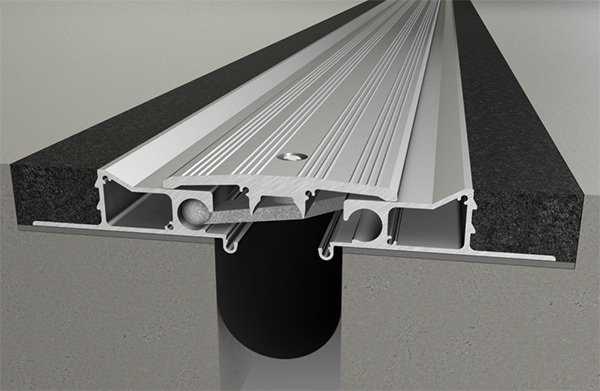 To counter this problem, CS’s Zip Block one-piece seal system absorbs the impact of the wheeled traffic, protecting the slab edge below (regardless of its condition). The epoxy bond remains intact under constant slab deflection and temperature extremes. With traditional compression seals, the adhesive can scrape off. When the slab shrinks, or is exposed to cold weather, direct tension is placed on the adhesive bond. When placed under this kind of stress, the bond can fail. CS’s solution to this is a ‘hybrid’ seal system – it maintains the compression fit, but it has larger slots in the sides to act as an adhesive reservoir which maintains a continuous bond. The common assumption is that products regularly installed in car parks are always fit for purpose and are able to withstand high rolling loads. This assumption is wrong. Many products cannot withstand high rolling loads, which leads to loose, rattling covers that pose trip hazards and generate noise. This presents ongoing challenges for facility maintenance managers. The ZB expansion joint series is fit for purpose and is designed with sufficient mass to withstand constant wheeled traffic. The product has been subjected to rigorous testing, including rolling loads of 3000lb per wheel, with simultaneous vertical slab deflection; sub-zero temperature testing, including several freeze-thaw cycles. At 35,000 cycles, the seal exhibited no wear or tear from the rolling load. This waterproof EJC is suitable for exterior & interior parking areas, and is much stronger than traditional elastomeric concrete systems. This recess mounted joint cover has one-piece elastomeric seals and integral nosings. ZB Series bonds to the substrate with a high strength epoxy adhesive and offers a highly durable, problem free and long-term solution. 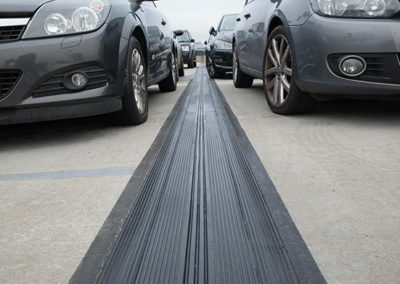 This is the surface mounted version of the ZB Series and is ideal for retrofit applications such as car parks where existing covers have degraded or failed. With no need for a blockout, ZB-SM offers a ramped wing seal to allow vehicles to pass easily over the joint. The cover offers simple installation and requires little maintenance. The closed cell design of HB Series allows ± 50% movement capacity. One-piece extruded EPDM joints create a strong, watertight seal and the serrated edges create ‘high-strength epoxy’ reservoirs to improve adhesion to the joint walls. With metal side frames available in aluminium (PDA) or Stainless Steel (PDS), combined with PVC wing seals that can be tied into waterproof systems, this system provides a watertight joint cover capable of accommodating movement up to ±60% of the joint width. The cover incorporates an extruded Santoprene gasket. This expansion joint cover is ideal for industrial applications due to its superior chemical resistance. The chemically inert material is a non-reactive & toxicologically harmless component. This flexible, resilient & UV stabilized cover is made from low density, closed cell expanded polyethylene. The grooves on each side of the material act to enhance its bond strength to the surface. CS metal expansion joint covers are manufactured using high strength aluminium. 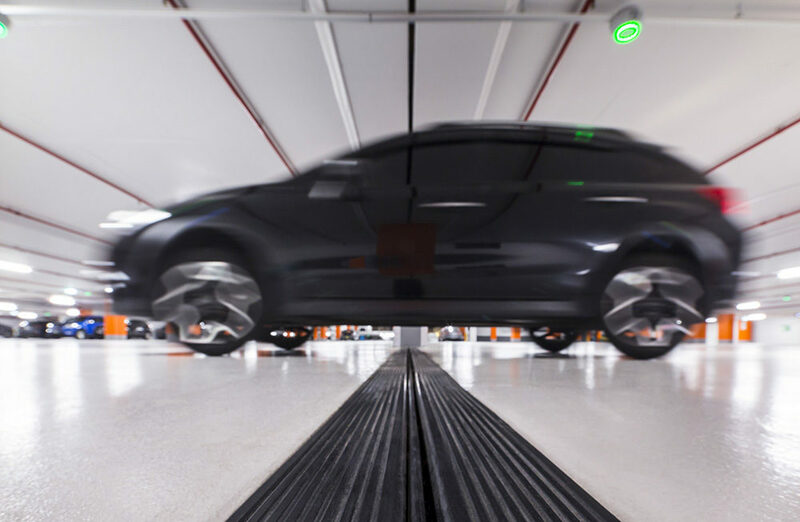 Regular vehicular movement can present challenges for parking EJC’s but the smart design of the CS range results in the force of impact being transferred away from the joint cover, and onto the concrete slab. Transferring the force like this avoids damage, deterioration and those irritating clanking noises that everyone can associate with parking structures. These heavy duty joint covers are supplied with a moisture barrier as standard and feature a patented turnbar housing which reduces lateral load damage. A specially designed, durable centre plate offers maximum strength. Heavy duty seismic expansion joint cover supplied with moisture barrier as standard. Incorporates a specially designed damper system which allows the central cover plate to move freely and prevents it from flapping and generating associated noise under dynamic traffic loads. Designed for use with heavy vehicle traffic in areas such as loading docks, airports and shopping centres. Designed to accommodate both new and retrofit installations – surface mounted, which removes the need for recess and slab blockouts. CSFMHD is a high lateral movement system for slab on ground applications. Tested to AS 4586:2013 to a slip resistance class of P5.